In the annual White House ritual ahead of Thanksgiving, two lucky turkeys (Apple and Cider) were spared a “shellacking” and granted a presidential pardon. 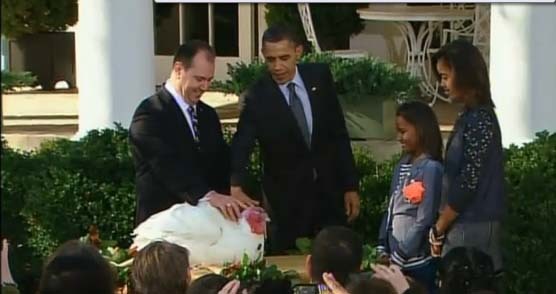 “Today, I have the awesome responsibility of granting a presidential pardon to a pair of turkeys,” Obama, standing with his two daughters in the White House Rose Garden, told a smiling audience. He explained the process that led to the birds' selection: two turkeys from a California ranch won the high-stakes competition by strutting to music before a panel of judges. “Only one pair would survive and win the big prize: life and an all-expenses-paid trip to Washington,” Obama said to laughter. The two turkeys will now spend the rest of their days on the grounds of Mount Vernon, the Virginia estate of the first U.S. president, George Washington.